Ricotta, goat cheese and herbs go amazingly well with beets so why not bake them all into one stunning beet tart? This recipe forms a creamy and savory base for the sweet, earthy root vegetable. What really takes the tart to the next level is how you layer on the beets. Cut them into thin, even slices, and arrange them in concentric circles so the overall effect is like a rose. 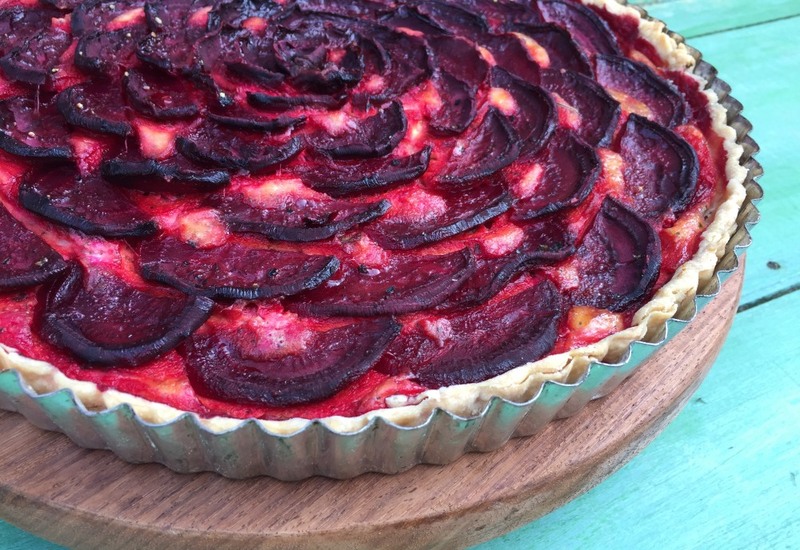 This tart is delicious, vibrant, and beautiful no matter what kind of beets you’re using whether it’s red or golden. To get a groovy ombre effect, seek out Chioggia beets (also known as candy cane beets), which are striped. Use a mandolin or spiralizer with the flat blade to slice the beets evenly and thinly, if you find that slicing them evenly with a knife is challenging. The tart dough is quite versatile. You can use it for both savory and sweet French-style tarts. Per Serving: 268 calories; 16g fat; 21.3g carbohydrates; 10g protein; 60mg cholesterol; 279mg sodium. This recipe is relatively easy to make and is a huge crowd pleaser. It's easy to slice the beets thinly, and the way their color sinks into the top of the cheese mixture makes it absolutely stunning when sliced. The fact that it's savory makes it a beautiful appetizer or light lunch alongside a simple salad dressed in classic vinaigrette. This is the first time I've been able to nail a homemade dough recipe! This recipe is so easy, not intimidating at all for a novice cook like myself. The beets not only made this a beautiful dish, but also very flavorful. The ricotta and goat cheeses were very complementary and rounded out the dish well. I also used my spiralzer to slice the beets. Simple and very delicious!